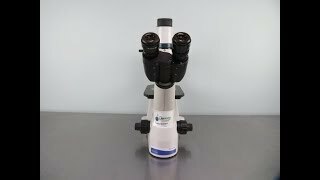 The Fisher Scientific Micromaster Inverted Microscope provides reliable comfortable use in a system ideal for education and research. This workhorse inverted microscope comes outfitted with a binocular Plan 10x, 22 mm FN high eyepoint eyepiece, 4x, 10x, 20x Objectives and a phase ring slider. This fixed stage microscope can be used for a range of micromanipulation techniques necessary for cyto-engineering, genetic engineering, electrophysiology, pharmacology and neurochemistry. This Fisher microscope is also an ideal for applications such as tissue culture, plaque measurement and blood typing and is compact enough to fit just about anywhere it’s needed. This inverted phase contrast microscope also features dual diopter adjustment (50-80mm), and dual side mounted coaxial focus knobs. This Fisher MicroMaster has been fully inspected and the optics are clear. All of our lab equipment comes backed with our standard warranty. Should you have any questions, please don't hesitate to contact us.